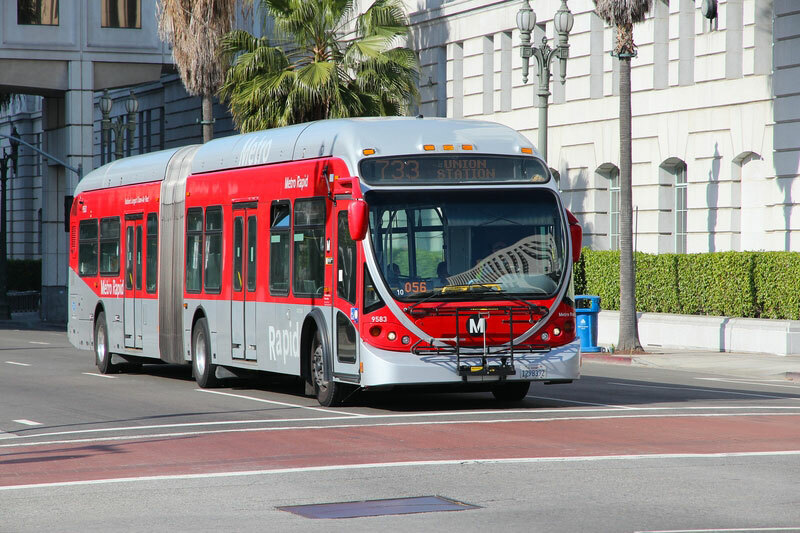 Step away from the car and get to know the real LA with its public transport networks! Driving in L.A. can really open the city up, but you can get to know the real LA by using its public transport networks. LA has one of the fastest growing systems in the country, with rail and bus links throughout the city, there are plenty of ways to travel that don’t involve sitting in a car for hours at a time! Here’s a run-down of LA’s public transport networks, so next time you’re in LA, exploring will be a breeze. The first Metro Rail line began running in 1990 with several new lines added in the intervening decades. As of 2016 there were over 90 stations serving downtown LA and surrounding suburbs. LA’s Metro Rail offers two subway lines, the Red Line and the Purple Line. Red Line – Starting at Union Station and finishing in North Hollywood, the Red Line will take you to Grand Park, Grand Central Market, the Hollywood Walk of Fame, Hollywood & Highland, and Universal Studios. Purple Line – The Purple Line shares stops with the Red Line from Union Station to Wiltshire/Vermont, before separating and heading into Koreatown. The Metro Rail also offers a light rail that stays above the ground for its majority, with four lines: Blue, Green, Gold, and Expo. 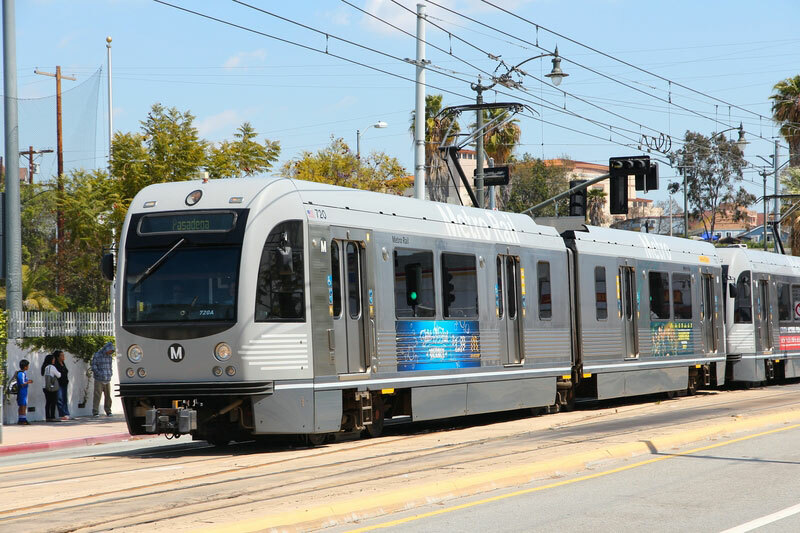 Blue Line – LA’s first Metro line to be built, the Blue Line begins in Downtown LA and heads south towards Long Beach. Green Line – The Green Line starts out in Norwalk and ends at Redondo Beach, taking you close to LAX on its way – but you’ll need a shuttle bus to get to the airport itself. Gold Line – The Gold Line forms a C-shape in North East LA, taking you from Atlantic in the east of the city to APU/Citrus College. With a path going through Chinatown, Pasadena, and San Gabriel Valley, you’ll get a great view of the San Gabriel Mountains! Expo Line – The Expo Line is the most recent addition to the light rail, going from Downtown LA to Santa Monica. It’s useful if you’re on your way to the Staples Centre, USC, or Santa Monica beach. Use the Metro rail maps and timetables to get around, and the Metro Trip Planner to plan your journey with ease. Los Angeles’ bus network covers nearly 200 lines with around 16,000 stops, meaning it’ll take you almost anywhere you want to go. You have the options of Metro Local, Rapid, Express, and Bus Rapid Transit (BRT). Metro Local – Metro Local buses are orange, and will take you to most major destinations in LA. The buses make frequent stops too, making it a very useful system. Metro Rapid – The red buses of Metro Rapid don’t have as many stops as Metro Local, but they have a cool feature that sends signals out to traffic lights, causing them to turn green as the bus approaches! Metro Express – Metro Express’ blue buses are a great way to travel along the freeways of the city. Metro BRT Silver – Metro Silver runs from Downtown LA to South Bay, stopping at Union Station along the way for easy access to train services. Metro BRT Orange – Starting in North Hollywood, the Orange line heads west to Canoga before forking north towards Chatsworth or south to Warner Centre. With over 30 million passengers boarding the City of Los Angeles Transportation’s DASH network every year, it’s another great way to access the whole city via bus, as DASH offers over 30 routes. Metro – Regular single ride fares are $1.75 if you pay by cash, but if you get a TAP card, $1.75 will get you a one-way trip that lets you transfer between other Metro lines for up to two hours. See the full list of fares. DASH – DASH buses charge just 50 cents for a single ride (or 25 cents for seniors and the disabled). The Metro Mobile App is a fantastic way to navigate the city, and it’s simple and easy to use. It even works alongside Google Maps! Los Angeles is a beautiful city to discover, with plenty of places to eat, drink, and be entertained – if you’re thinking of visiting, you can always ditch the car and make use of the city’s growing transport network.